On August 25, 2017 the Alex Jones Channel featured Roger Stone and Douglas Hagmann in a video called Emergency: Democrat Plan to Kill Cops and Overthrow Government Discovered. This wild headline highlights the extent that the major players in the Alternative News Media will go to flee the phantoms which they created, and might just be held accountable for, by their adversaries. Roger Stone, is notorious for his dirty tricks as a Republican/Libertarian political operative, who was deeply involved in several presidential election campaigns. He has been on the Alex Jones show several times, and at least once this year on the Hagmann Report. Both Alex Jones and Douglas Hagmann are noted for their dependence on anonymous, as well as public, Insider sources for their breaking news stories, whether the subject matter concerns government actions, financial markets, or politics. In developing today’s theme on the Alternative News Media Rat Lines linked to the so called Deep State, our foundational question is, what is Source Journalism? And how does that compare to old fashioned investigative journalism where the reporter receives information gained from one-on-one questioning of original sources? Apparently, this is a widespread situation in Main Stream Media, for Zwicker on page 141, quotes William Colby, former director of the CIA as stating, “The Central Intelligence Agency owns everyone of any significance in the major media.” But does this apply to the major players in the Alternative News Media, which are always valuing themselves as a cut above others, when it comes to ethics and telling the truth? Examples of Source Journalism in the Alternative News Media include not just Alex Jones with his covert military insider news leaks, or George Webb with his insider source who led him to believe that a dirty bomb might be on board the Maersk Memphis ship. We must also add to this list, a Christian Truther, Douglas Hagmann, who built his investigative reporter reputation upon insider sources such as Rosebud, W the Intelligence Insider, and the false credentials of V-the Guerrilla Economist. So why would any journalist who claimed to have integrity take the side of a dirty tricks political operative, such as Roger Stone when government officials want to question his actions? 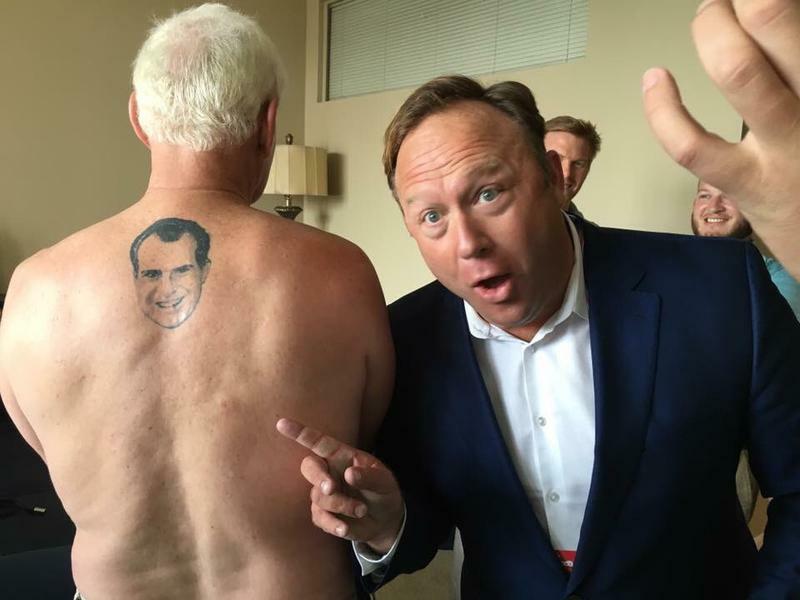 Alex Jones showing Roger Stone’s tattoo of Richard Nixon on his back. Roger Stone is known for having set many other people up. So why should anyone care whether this guy is “being set-up”, unless one feels a kindred spirit with him? He has always prided himself in serving the Deep State, using the most unethical means. 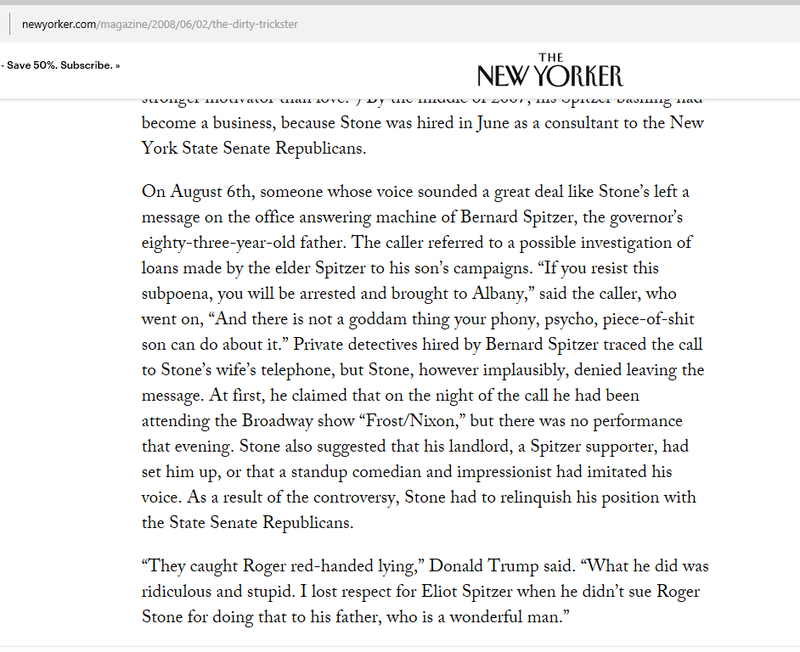 Stone is not above making the anonymous threatening phone call if needed, as noted in this screenshot from the New Yorker. Note that despite Donald Trump’s disapproval of Stone’s behavior, he had no problem entering into a working relationship with him years later, when he decided to campaign for President of the United States. If you are unfamiliar with the vast number of stories on Roger Stone, it is advisable to spend some time on the internet, acquainting yourself with the fascinating and at times, vulgar details. A good commentary on Stone which has many links to other sources is italkyoubored.wordpress.com. The author, who appears to want to remain anonymous, but may use the pen name F. Fred Palakon, a fictional character in a novel, published a ten part series in 2014, called Roger Stone: Pretty Reckless Is Going Straight To Hell. The author is very clearly a good writer and researcher, documenting his sources thoroughly. 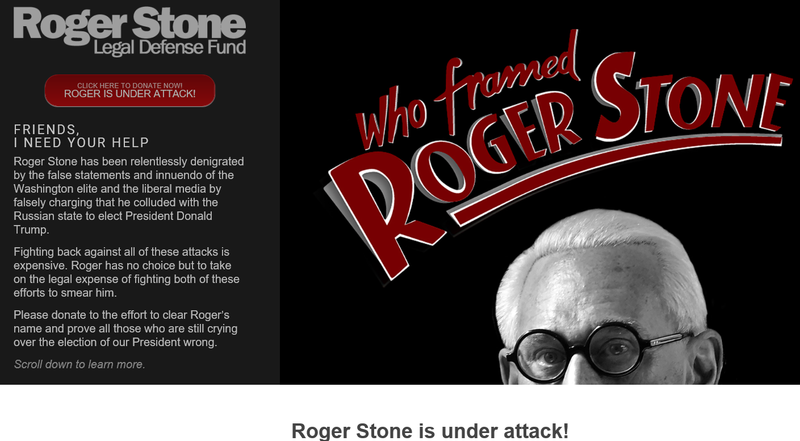 One of Stone’s websites is called Who Framed Roger Stone? 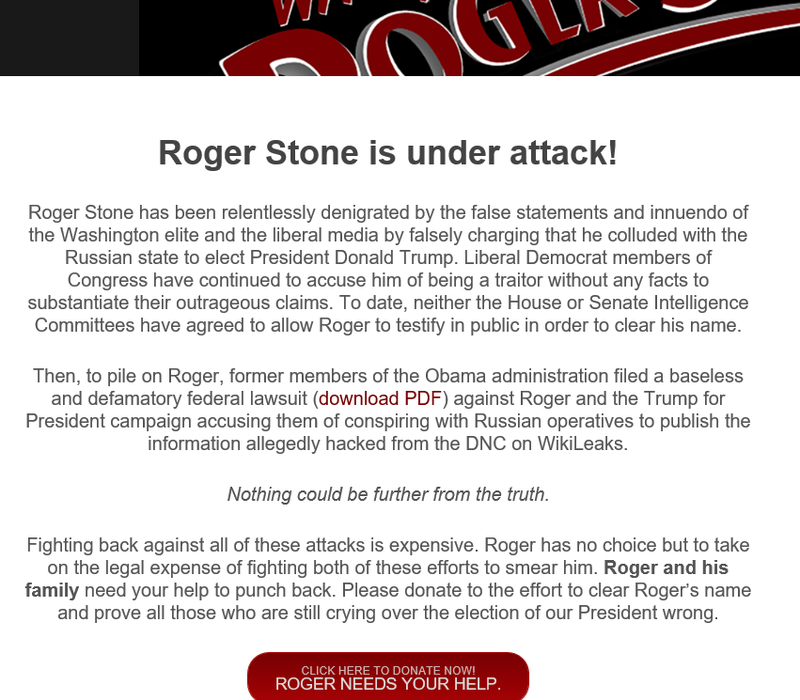 At this website, poor persecuted Roger Stone, whose bad karma chickens are returning to roost in his highly expensive hair plugs, wants donations for his legal defense. This link also displays a copy of the lawsuit filed against President Trump and Roger Stone by 3 persons connected with the DNC, who had their personal information revealed when a hacker gave their emails to WikiLeaks. 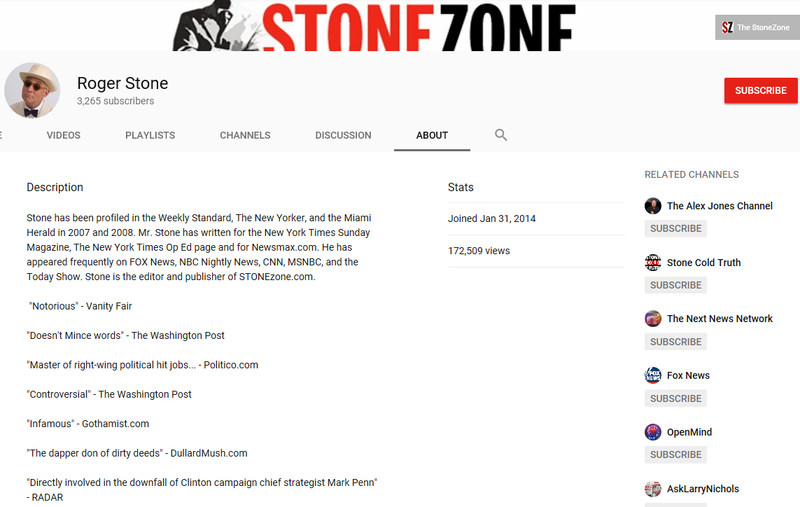 When I looked at Roger Stone’s YouTube Account, his related accounts were interesting. You may have guessed that he would display the Alex Jones channel, but he also shows Ask Larry Nichols, you know, that Clinton “hitman” from the good old days in Arkansas, back when Mena Airport was overrun by the CIA and drug runners. Why not Ask Larry Nichols how to undo your bad karma, Roger? I have no clue if Roger Stone is linked to Russian rat lines. Perhaps for once in his life, he is innocent of the charges recently leveled against him. 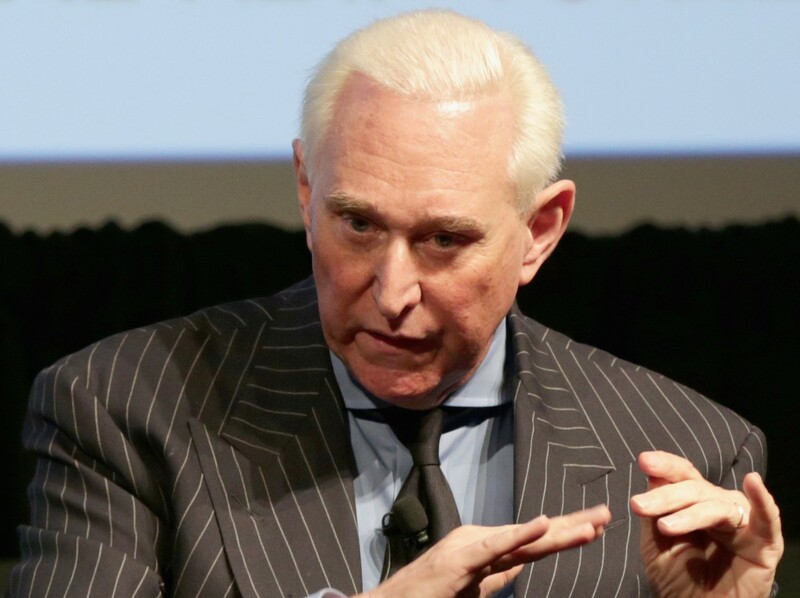 However, after reviewing Stone’s life, and the amount of money which his crooked behavior got him, all the while wearing his infamous vertical pinstriped suits, perhaps it is time for his tailor to start measuring him for the horizontal striped suits that could become his new insignia. For a number of years, Roger Stone was a partner in the lobbyist/political counseling firm of Black, Manafort, Stone and Kelly (BMS&K). Here is a snippet of a 1989 Washington Post article on the clients which this firm represented. If you read the current lawsuit against Trump and Stone which is linked in the Who Framed Roger Stone? website above, you will note that Manafort’s name is mentioned. 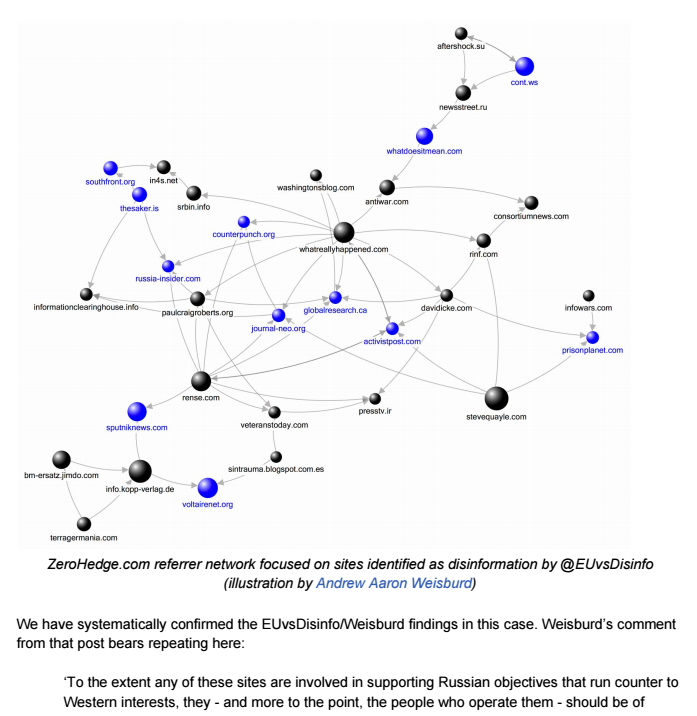 As I was considering this lawsuit, and the charges of working with Russian operatives to impact the 2016 election, I came across an interesting website with a 32 page pdf called Black Friday Report: On Russian Propaganda Network Mapping, published November 26, 2016. The contributors to this project call it PropOrNot, meaning, Is It Propaganda or Not? 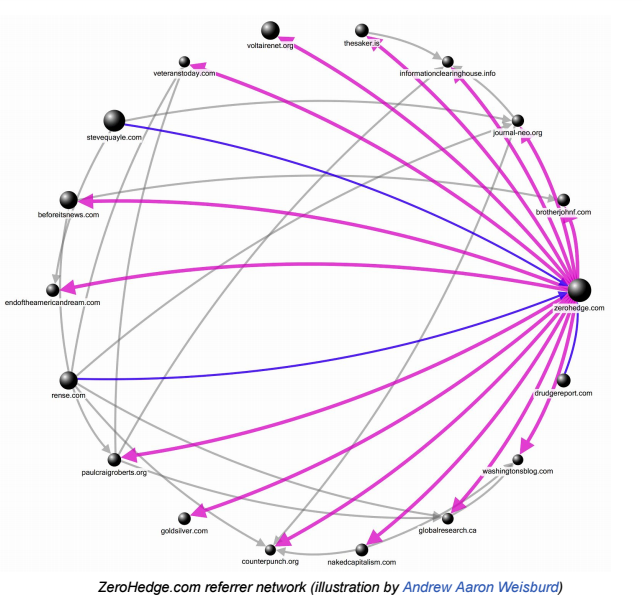 Two of their charts caught my eye, where they were tracking zerohedge.com as an example of their methods. I noted that it lists stevequayle.com. along with other Alternative News Media websites which I am familiar with. This other chart reflects a different way of illustrating relationships, but also includes stevequayle.com. on their sites identified as disinformation. This pdf is interesting to read through in its entirety, in that it describes exactly what standards they used to analyze websites which have mimicked the Russian propaganda line in their news reporting, sometimes word for word. I wish that more websites such as this named their contributors; however, one can review and test the guidelines and methods they used to verify that their conclusions are valid. I have linked to some long pdfs in this post, so perhaps the reader may wish to read them as a rainy day project. Personally I hate politics, and the last time I read extensively on this topic was back when Watergate had been exposed. However, given the fears which some have regarding the present freedoms of the internet being restricted, it may be time to take a closer look at the real impact which Source Journalism has had in distorting accurate news reporting.